← Official cover for ‘Isis, Vampires and Ghosts – Oh My!’ released! The not so Happy Holiday spirit. As we welcome November and the warmer weather here, we say good bye to what seems to be a controversial holiday here in Australia – Halloween. And yes, this has nothing to do with writing or me wearing my author badge and all, but it is something I have had issues with this year and so wanted to talk about it. Basically, the concept and celebration of Halloween here in Australia is only really just taking off. I refuse to say it’s only just started as I know of many families from Canada and America who have attempted to celebrate it here for years. At first it seemed to tentatively be accepted and taken on board, but in the last few years – this year in my area especially so – it seems to have turned rather nasty. And it’s not the trick or treaters that are making it nasty, it’s the anti-Halloween bah humbuggers who are getting quite vocal and rude with it that is making it into a bad word to use in these thar hills. I left a good twenty groups and unliked pages on Facebook in the past few weeks as their anti-Halloween ranting turned into all out racist drivel towards America – the ‘United States of’ in most cases. It was very ugly to see such open and encouraged comments about how we shouldn’t let the American’s do this or that… and degraded into generalisations over them all being fat, lazy and stupid – I was appalled. And I really am starting to see that Australia really is as racist as the rest of the world seems to think we are and I am so very embarrassed to be Australian because of it. The disgracefully sexist behaviour and attitudes to our one (and possibly only at this rate) female Prime Ministers was bad enough… But to degrade a holiday to that! Horrid. Oh, and when you start a sentence with “I’m not a racist but…” yeah, you’re being racist. Saying it with a smile on your face or a laugh in your voice doesn’t lessen it either. I see not as much nastiness went on about those also celebrating Dia de los Muertos (Day of the Dead) or Diwali – both holidays around the same time. Then again, perhaps as those holidays hold more for grown-ups it’s okay to embrace those multi-cultural celebrations… or possibly as they’re not ‘American’? Okay, so that’s what depressed me about Halloween this year. It wasn’t just all the Bah Humbuggery that went on, it was what it degraded to. Uncool Australia, very uncool. Back to Halloween. Why have I become so passionate about this holiday? When it goes against all my principals and beliefs? Because it means so much to my husband. I do my best to spoil him on Father’s day too as he was raised to celebrate it when I wasn’t. But with me being as romantic as a dead whale at a beach wedding – he is not getting Valentine’s Day. Halloween also gives me a time to be creative. We make a lot of our scary props and decorations, and I get to bake! 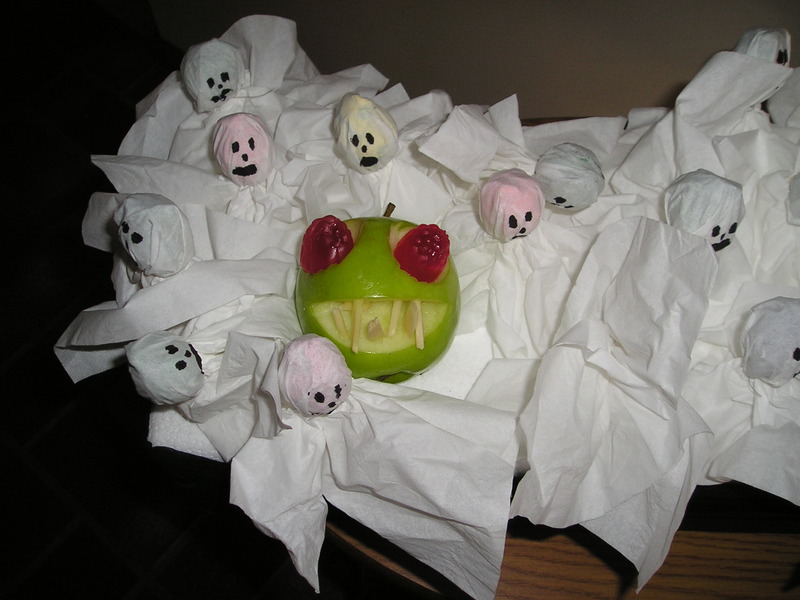 Rockyroad kill, bleeding eyeballs, blood and gutcakes, scary apples, monster teeth, witch’s fingers – it’s all good. Sadly this year I didn’t get to make anything as a sinus infection followed by suspected shingles does tend to drain one a tad. Another downer to this year’s holiday was husband had to do the late shift and so couldn’t take our cat girl, witch or two faced Bob out trick or treating. 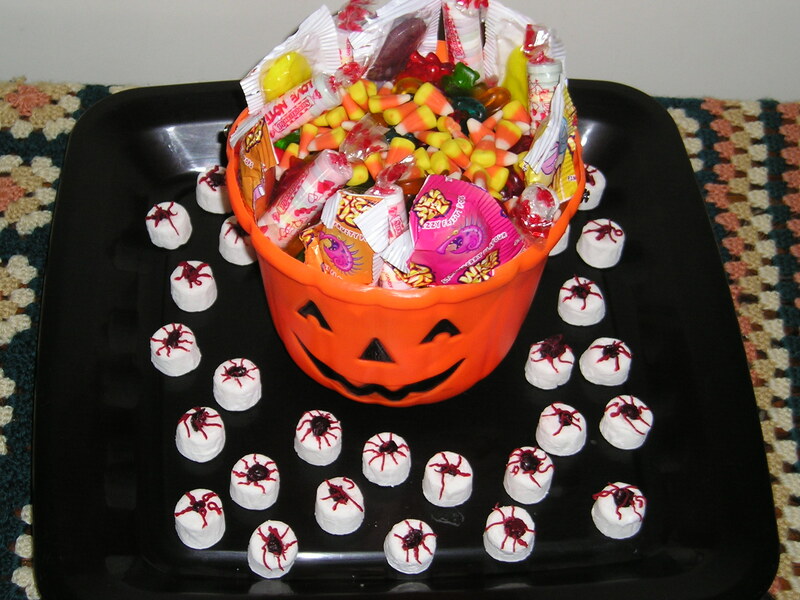 I was too sick to take them, but helped man/woman/person the front door and hand out all the sugary ungoodness I could to anyone in a costume. My kids did get to visit a neighbour around the corner who I knew was expecting them and who they could get to without having to go on the road. So they did at least get something for their trick or treat bags. I had them try other neighbours we are friendly with, but got no answer from their knocks. So they were either not home or taking a silent stand against the holiday – which is fine. I feel a polite response like that far better than the ones where people were threatening to leave their large, aggressive dogs chained to the front gate, or even the angry carved pumpkin signs with a cross through them saying ‘Halloween and trick or treaters unwanted here’. That, to me, is just rude… and would lead back to the negativity I mentioned before if I let it. But meh, there is so much negativity in this world right now that me whinging on about it all the time isn’t going to be beneficial or really that interesting. So instead, let me look at what I did see from Halloween this year. My kids were excited and got to dress up for a parade at school as well as dress up again at home. Their parents (their dad more than bed ridden me) decked out the house with spiders and bats and pumpkins and all those stereo typical Halloween guff. 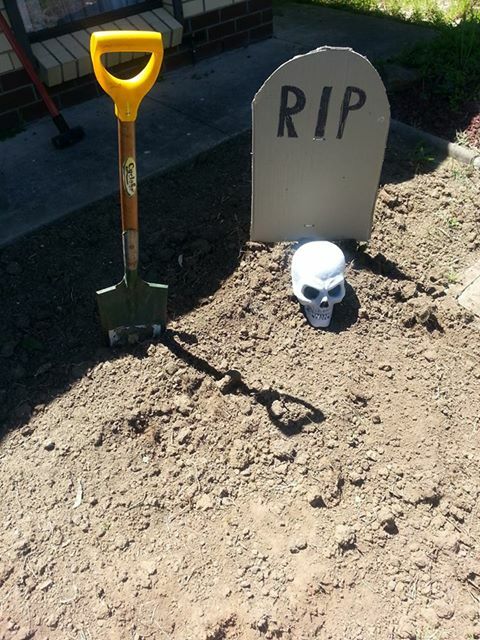 Hubby even made a grave in the front yard and put a fake skull on it (picture below). We had excited kids leap out of cars or race down the street in a mixture of home-made and shop bought costumes. They gasped at the grave and laughed and the flashing pumpkin lights and were so happy to be allowed to take copious amounts of lollies from our over-flowing pumpkin head. My kids, despite the slim pickings out trick or treating, had a great evening too. They got to play out in the front yard until it was dark (which was about 8pm – don’t tell their dad I let them stay up so late. 😉 ). They played amongst the weeds and grave, they danced along the lawn encouraging more trick or treaters to come visit. They waved and shouted hello to the cars that drove by, and got a lot of people smiling and waving back. They stopped every single person who walked down our street and wished them a happy Halloween and patted their dogs (if they had them) and all in all were great neighbourly kids. Polite, happy and a little rowdy. You really don’t see many kids out the front of houses like that anymore. They’re either tucked away in their backyards or glued to the TV set. Heck, mine are usually in the backyard too but that’s as they’re riding bikes and scooters or communing with their pets and none of that is best done near the road. Especially as not everyone around here sticks to the speed limit. Still, I was watching them from the couch, going to check on them (and asked them to turn the volume on their voices down) every now and then and it was just a once the year thing. That is what Halloween was to my kids. Fun, play, meet new people (we don’t believe in stranger danger, merely stranger awareness as they could just be a friend you’ve not yet met) and get a few lollies at the end of it.